This site documents Diary of Smells, an on-going, multi-sensorial project by Josely Carvalho in which she directly uses natural and artificial scents as protagonists among other typically dominant visual and sound components in her installations. 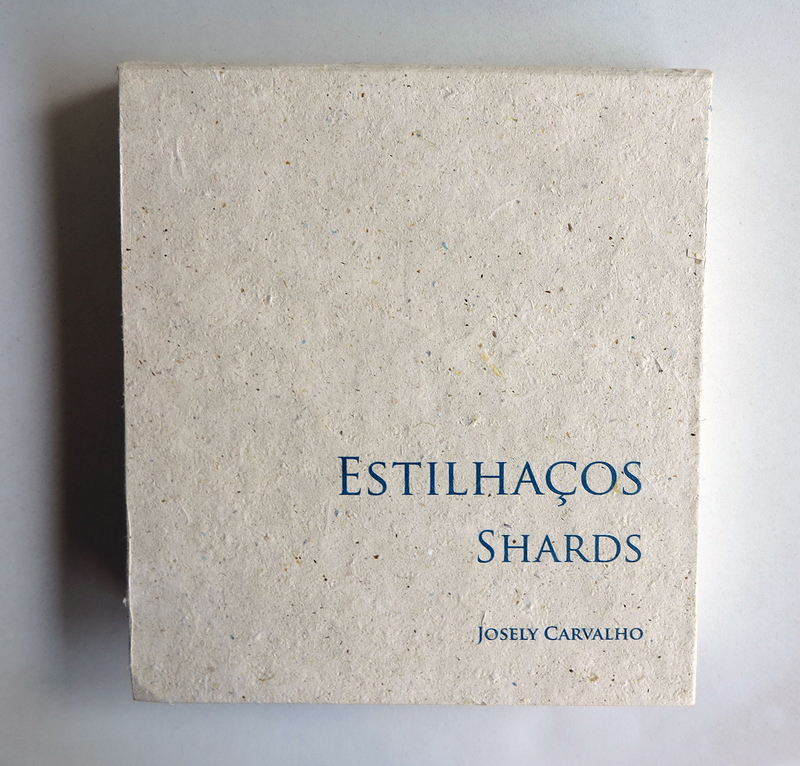 Diary of Smells: Shards (Estilhaços) is a work in progress organized by a visual/sound/olfactory installation and an olfactory artist’s book. 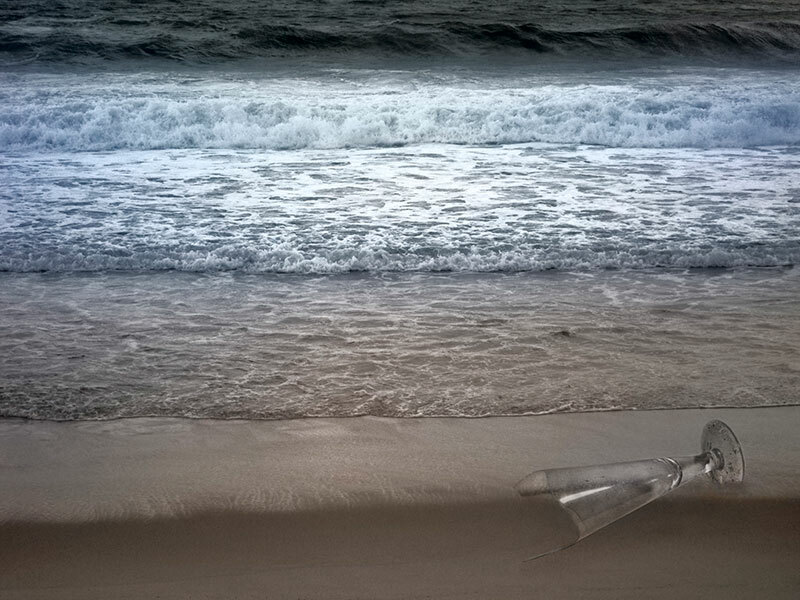 From the shards of broken wine glasses emerges a memory smell of a forgotten moment. 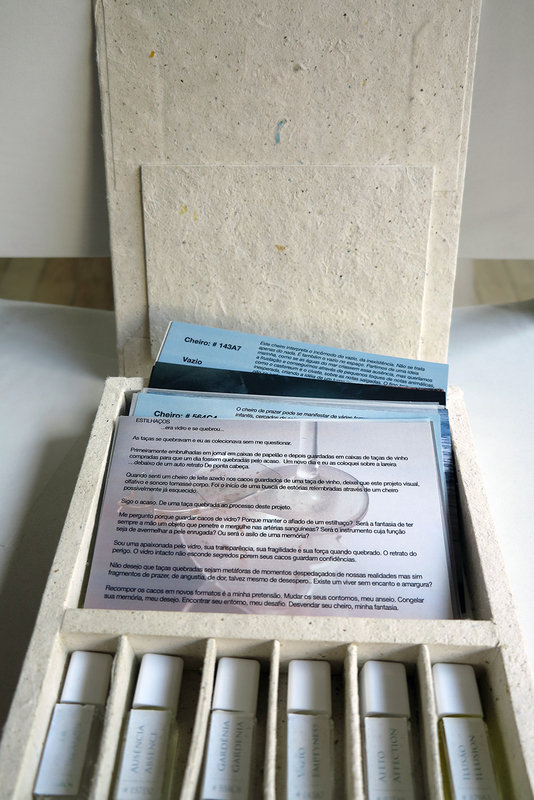 The smells are reconstructed from texts written by invited writers and produced with the collaboration of Givaudan do Brasil, a leading fragrances and flavor company. Seven photographs place the glasses and their smells in imaginary landscapes where the scents of a lost love, of an encounter, an absence can perhaps be detected. 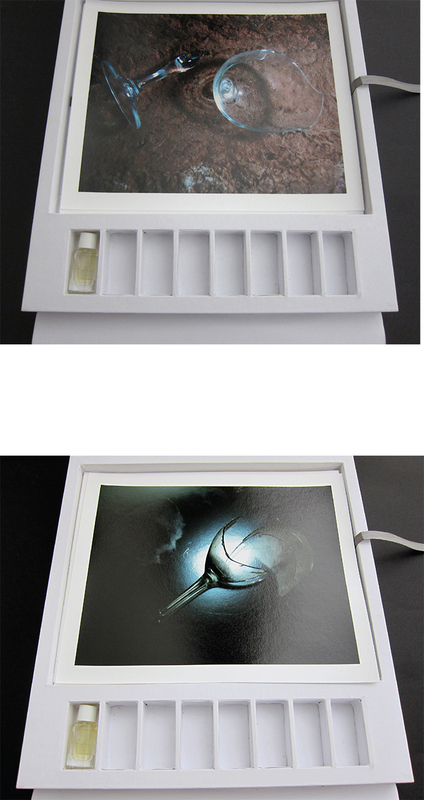 An edition of 130 olfactory artist’s book, the book contains seven photographs printed as postal cards; six numbered fragrances presented in small flasks; six memory/smell texts. The original smells are: Affection; Emptiness; Absence; Persistence; Pleasure; Illusion. The bookbinding takes the shape of a box wrapped in handmade paper produced by Prof. Thérèse Hoffman Gatti, at the National University of Brasilia. The paper is made up of recycled cellulose of cigarette butts & banana leaves and uses nanotechnology to insert its fibers, the fragrance “Glass” created by French perfumer Nadège Le Garlantezec. The project is a collaboration among artist, guest writers, Givaudan do Brasil and the National University of Brasilia. Among the writers are: Laura Abreu (curator, National Museum of Fine Arts, Rio de Janeiro); Mary Garcia Castro, PHD (Poet and Professor of Sociology at the Federal University of Bahia); Avis Lang (writer and editor of Museum of National History, New York), Josely Carvalho (artist), Dr. Jeff Koán MD (independent curator).